Mr Mound is a Business Studies teacher who graduated from Sheffield University before working for The Royal and Sun Alliance Insurance Group before taking his teaching qualifications at Wolverhampton University. 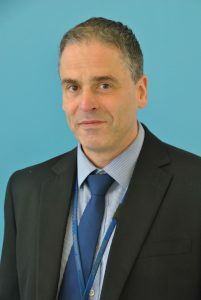 He worked at Broadway before moving to Moseley School and then returned Broadway to take up the position of Head of Business Studies, during which he was also responsible for co-ordinating the school’s work experience programme, Education Maintenance Allowance scheme and vocational college placements. Subsequently he became Director of Technical and Vocational Education and then an Assistant Headteacher. His current responsibilities include the Humanities Directorate and overseeing the school’s timetable, he also became a Staff Governor in May 2017. He is a firm believer in the old mantra that every child should “enjoy and achieve” in their time at school and that producing well-rounded individuals is also a key indicator of a school’s success.